Cuckoo performs the wonderful “O Gore Gore Mukhde” which might be my favorite song from this, although the Rangoon song is right up there too. Well, and several others. So never mind about the favorite part. It’s an excellent song, though. who grows up to be Yakub—and a traffic constable (which makes me laugh out loud). Happy-go-lucky Raja is distracted one day by a song and dance (“Duniya Ko Pyaare”) featuring a beautiful girl named Rani (Nigar Sultana) and her father, who sell some sort of “medicinal” tonic to the crowd which gathers. Raja is instantly smitten by Rani and forgets to return to his post, resulting in a car crash and his suspension from the force for a year. Being the sole earner in his family, with six sisters and aging parents to support, Raja needs to find another job. 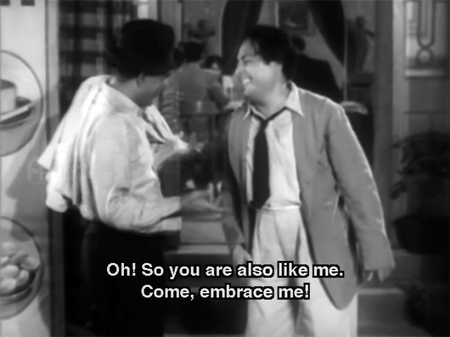 He soon encounters Rani again, and they decide to team up and take to the stage (after encounters with a very young Ram Avtar and Raj Mehra—this film is chock-full of early appearances!). As a side note—the voice track for the conversation where they agree to find stage work together has apparently been lost, because the dvd shows them talking with music overlaid instead of dialogue; it’s a better solution than just cutting the scene altogether, and kudos to fIENDS for that. To that end, they seek out the proprietor (to say the least) of a local theater company, Natharam Gope (Gope). Gope is a big blowhard with a crush on the company’s leading lady, Miss Jalwa (the beautiful Mohana). 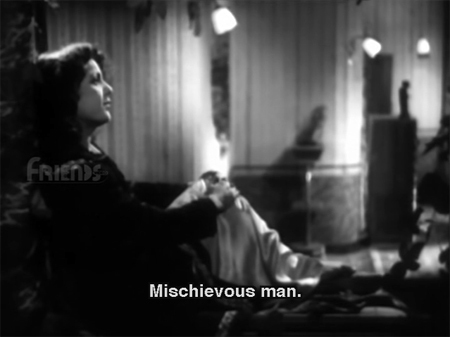 Miss Jalwa is not much of an actress, which makes for some very funny scenes. Gope doesn’t have much use for Raja and Rani, and they quickly improvise by crashing the stage as the curtain goes up. Luckily, Rani’s sweet voice and Raja’s antics are a big crowd-pleaser, and they are hired. Raja is sure that Rani returns his feelings—although he has not expressed them to her—and promises his Ma and sisters that he’ll be bringing a bride home for them soon. We are treated to some of the troupe’s performances, most notably the aforementioned “Mere Piya Gaye Rangoon”—a song which is just too fabulous to be missed. Gope completely cracks me up, and C Ramchandra and Shamshad Begum’s vocals are perfect for the picturization on Gope and Nigar Sultana too. And I have to give props to fIENDS again (I know! It’s killing me!!!) for subtitling the songs in this, the lyrics are just so witty too. Raja and Rani assimilate well into Gope’s company, and Raja falls ever more deeply in love with her. Lots of fat jokes are made at Gope’s expense, and they are so very silly that I giggle helplessly. But Rani is about to meet Shyam (Shyam), the wealthy son of a jagirdar father. Shyam sets out to charm Rani on a bet with his best friend (Randhir), and she gives him short shrift. In his book “Stars from Another Sky” Saadat Hasan Manto devotes an entire chapter to his close friend Shyam in the wake of his tragically early death in 1951 during the filming of Shabistan (Shyam was killed after being thrown by a horse). 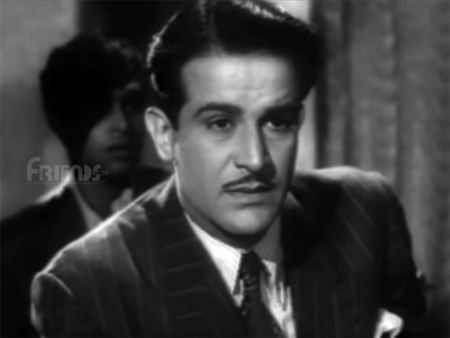 Shyam personifies the type of “old Hollywood” star along the lines of Errol Flynn and John Barrymore, and was apparently very like that in real life too. Manto describes him as a fun-loving, open-hearted ladies’ man, who despite his adoration for his wife Taji (they had a turbulent but passionate relationship) had a bit of a roving eye. According to Manto too, Shyam and Nigar Sultana had a “thing” going for some time (several years before this was made) and remained on good terms—it shows in this as they share sparkling chemistry and an obvious comfort level with one another. 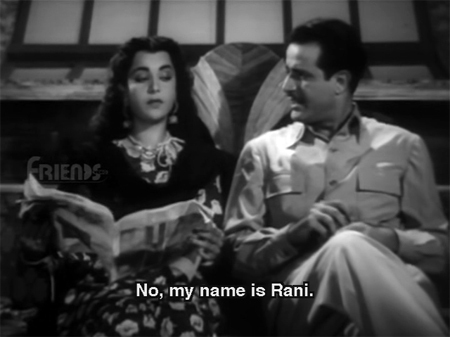 Anyway, Rani is disdainful of the flirtatious Shyam and gives him a tight slap into the bargain which he cheerily reminds her about later that evening from the front row of the audience. The song being performed now is “Pyar Ke Jahan Ki Nirali” picturized on Rani and Miss Jalwa, and I am struck by how very pretty Mohana is too. Now a bit more determined and serious, Shyam continues to pursue Rani with protestations of love—but she is wary, although also charmed. Shyam decides to use a trick to entice her and goes home to get some money out of his wealthy father. His father though is fed up with Shyam’s irresponsible ways and refuses to give him any money. This is clearly an old argument, and we also discover that his father wants him to marry his ward Poornima (Purnima). I instantly despise Poornima, who is a whiny, clingy and miserable creature moping around after Shyam. 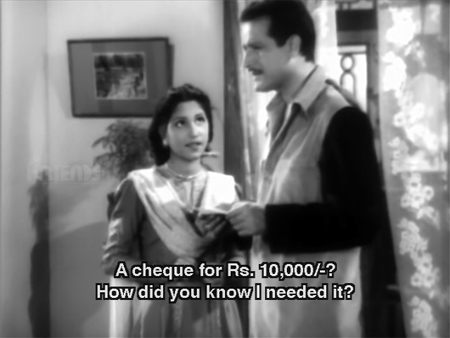 She lends Shyam the money he needs, not realizing that he’s planning to use it to attract another woman. So now we have the lovely and vivacious Rani, who is beginning to have feelings for the happy-go-lucky but irresponsible Shyam—who is engaged to a girl who is irritating beyond belief; and sweet devoted Raja, who is hopelessly in love with Rani and has no idea that he has a rival. Shyam takes the money from Poornima and sets himself up in one of his father’s houses which has been standing vacant for some time. He disguises himself as an older wealthy jagirdar along the lines of his own father, and hires Gope’s theater troupe to come and entertain on the occasion of his “son’s” birthday (buddy Randhir is posing as his son). There are a lot of songs in this movie, so thank goodness they are so wonderful! Afterwards, Shyam reveals his true identity to Rani, who has been regretting that she let him go earlier, and they declare their love for each other. Shyam is truly serious about his feelings now and for a few brief moments they are blissfully happy. But Shyam’s father soon arrives, and he is furious at the events unfolding. Plus Raja finally cottons on to the fact that Rani loves someone else, which breaks his heart. Both he and Shyam’s father refuse to believe that fickle Shyam has actually fallen in love with Rani. Even Gope objects—he doesn’t want to lose his star performer! And whiny Poornima is not going to give up on her childhood love Shyam so easily either, and she sets out to lay the guilt on thick. but she’s a persistent little bugger. Can our beautiful lovers overcome the obstacles of guilt, class differences, parental objections and attempted suicide? Will Shyam’s steadfast refusal to abandon his Rani in the face of all of this be rewarded? Raja himself is magnanimous though broken-hearted—once he realizes that Shyam is sincere, he is willing to accept that he has lost in the game of love. He understands that true love sometimes means letting go. That is sacrifice which actually matters! In a nutshell, the dreadful Poornima guilts Rani into letting Shyam go and getting them married instead—Rani dresses Poornima in her bridal gown and tells Shyam that Poornima truly loves him. Well, obviously she does: she sings lots of sad songs in his hearing; refuses to listen to him when he tells her he doesn’t return her feelings and that he loves Rani; throws herself in front of Rani’s car when he leaves; and slaps Rani and calls her a witch when she takes Poornima in and has her treated with care. Massive, massive *eye-roll*. After sticking Shyam with Poornima, Rani goes to find Raja and they are united. The major flaw in this ending is that Poornima is so very, very, very unlikable. Petulant, childish, ungenerous in spirit—how on earth is it okay that the lovely Shyam gets stuck with her?! I’m okay with Raja and Rani ending up together—Raja truly does understand the meaning of love and it’s not hard to believe that he will make Rani happy once she gets over Shyam. And if Poornima had been a much better and less one-dimensional character, more worthy of Shyam, it could have worked too. But as it is: poor, poor Shyam! With this Poornima at his side, he can look forward to nothing but a life full of misery and manipulation. And seriously, he does not deserve that. It makes whatever messages about love the film might have contained completely inarticulate, contradictory and pointless. Arggghhh. Watch it for the songs, gorgeous Shyam (or Nigar and Mohana, depending on your point of view), and the antics of Gope and Yakub. Just turn it off half an hour before the actual ending and make up your own version. It’ll be a much better movie that way. Posted on September 4, 2010 at 3:45 pm in Hindi movies	| RSS feed You can skip to the end and leave a reply. Just saw this movie not too long ago and I had the same thinking you did. Poornima’s character basically whined her way into getting married to Shyam. Only in movies!! On a side note, I actually thought Poornima, appearance-wise, was always very attractive. I was always confused as to why they made her become a mother and bhabi very early because she looks like a teen here. I always thought she was very pretty too, but she is a really BAD actress. I can even tell, and I’m not that good at detecting such things, or so I am told. So maybe that’s why. To be a bhabhi or a Ma you only have to be able to cry :) and that, she can do. 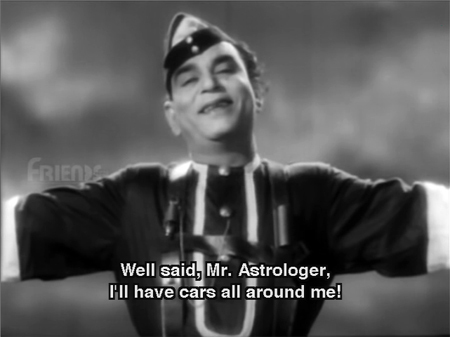 Though I missed seeing this movie, Ever since I was four, I had always been hearing the joke about the astrologer’s prediction that you so relevantly pointed out. Then the song MERE PIYA GAYE RANGOON…. Yes, everyone knows the song and it has been even remixed with new settings. There were many Indians in Rangoon in the Forties until they were driven away by the Burmese. Another song which very few people know about is the one you mentioned: PYAAR KE JAHAAN KI NIRAALI SARKAR HAI…. I had a fixation about this one because of the imaginative concept about Sarkar, Thanedaar, Havaldaar, and Chowkidaar. But surprisingly, I never knew ahout Shyam, Nigar and some other stars even in my childhood, save and excepting about the death of Shyam. Yakub was a great all-round actor too. 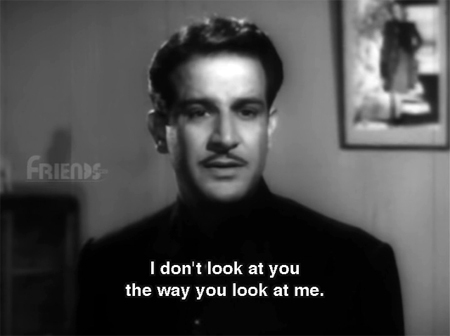 But then, I missed almost all his movies except for Deedar and Paying Guest. All said and done, I have a good mind to purchase this VCD when suitable opportunities arise. Alas, I don’t think you’re going to find any solace in the present, my dear. So I think you went in the right direction. True. And with the present there is no wiggle room. With the past you can say oh that was a long time ago–those poor benighted fools. LOL! That’s kind of what I decided. It’s a 50/50 proposition. At least I got Shyam! What a gorgeous man he was. And the songs…so completely FUN to watch. Lovely review, Greta. As usual! Have not seen this movie. All I knew of this movie till now was “mere piya gaye rangoon” (one of the iconic songs of Hindi cinema). Have just watched two other songs on youtube now after reading the review (“gore gore mukhde” and “pyar ke jahaan”). Liked them. I remember seeing Yakub in Nirala and Paying Guest. Did make an impression. Have not seen any Shyam movie yet but from what I have read, he seems to have had all signs of being on the way to becoming a really big star. You seem to be very impressed by him too. Imdb lists Ajit and Rajendranath also in the credits. What were their roles? Imdb is just completely delusional about this…even though it says the credits are complete and verified they don’t actually match the credits in the film at all. 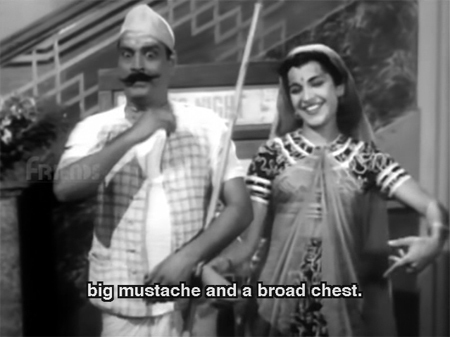 Ajit and Rajendranath (and Shashi Kapoor, and Shyama) were not in this film, and not in the credits either. I think it’s safe to say that whoever wrote the imdb entry for Patanga had no idea what he/she was talking about. Shyam was totally Made Of Awesome. He left us way too soon–would have been right up there with the Big 3. The imdb entry for 1971’s Patanga (with that famous song “thoda ruk jaayegi”) is mixed up with this Patanga. That’s right Raja. Shashi starred opposite Vimi in Patanga of 1971 and the song you mentioned was indeed a great hit though the movie was not. Really speaking, it’s not a mistake of the part of imdb but plain indifference and lack of filmi common sense, for that makes the job easier, bracketing all the similar names. The mistake occurs on our part who rely on that data. Shyama was in this as the wife of the Gardener. The other credits (Ajith, Rajinder and Shashi) are from the 1971 Patanaga apparently. I wonder if IMDB might have been referring to the Shashi Kapoor starrer Patanga, which was a color film. I think it had Rajendranath as well. I remember hearing some songs from this one. 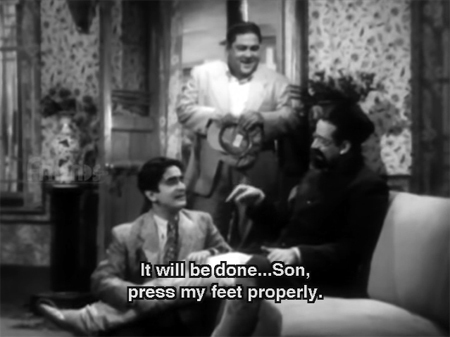 There were some good Rafi numbers and might have been one of the last Shankar-Jaikishen films. And thank you—of course you are right. I even have the Shashi Patanga, although I haven’t watched it yet. Maybe that’s the one I should watch this afternoon! :D Although the songs from this one will be hard to beat! You have decided wisely Memsaab. I know only “mera piya gaya Rangoon” from this movie and thought that the song was quite fun. Now I am going to keep this on list of movies to watch. The comedy makes up more than enough for the silly ending. Yes, the silly ending is just a blip on the otherwise good fun. And even the relationships and the story are very sensible and well done up until then. And most of the songs are just superb. Amazing how trying to pander to what one *thinks* audience expectations will be can really ruin an otherwise excellent movie. I bought the VCD for this movie for its songs. Unfortunately only a very small postion of the VCD worked and I managed to listen to a few songs (for which I had bought it in the fist place). I missed out the story. I do not regret that (in view of the review of this movie here), but I missed listening to a few songs because of non working VCD. This movie is a must for music lovers. C Ramchandra is at his creative best here , alongwith lyricist P L Santoshi. Shyam is yum, isn’t he? :-) I’ve only seen one film of his as far as I remember – Samadhi, and I did wish he had more of a part in that. Also C Ramchandra, and also superb music. Now there is something interesting here I think but I need help Memsaab. In the tags I see the name Harnam Singh Rawail which effectively translates into H.S.Rawail the maker of Mere Mehboob. Is it a coincidence or is it the same person? I see Rajendra Kumar here too I have heard that H.S.Rawail and Rajendra Kumar were related. So can someone enlighten me? Yes, he is the very same person. Do you know how he and Rajendra Kumar were related? I had not heard that before, but it seems likely. They did a lot of films together. 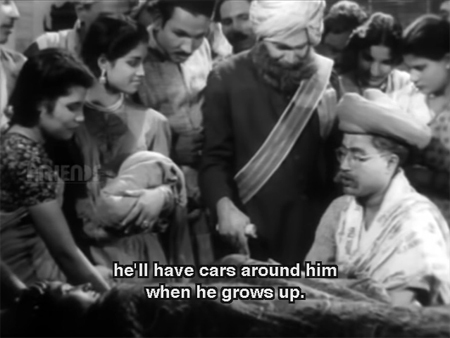 Actually his first break was in “Mela” 1948 where he was seen as an extra for a fleeting second. “Patanga” was released in 1949. 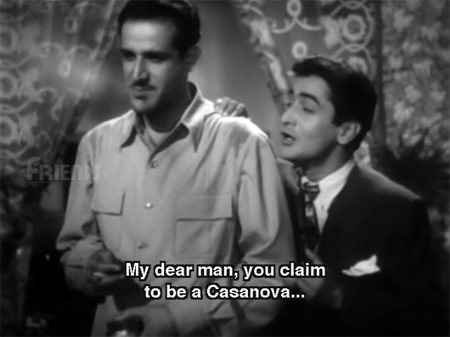 He was seen more clearly in “Jogan” 1950 – clearly showing ihs adoration for Dilip Kumar! Rajender Kumar was related to O.P. Ralhan (phool aur pathar). His sister was married to him. Well, if it was real life, you can imagine what comes next. Shyam will be heart-broken for a time, then he will go and pester Rani, who is now married to Raja. And then they will have an affair. Both Raja and Poornima will be sad. Shyam will get tired of the affair and his rovign eye will move to somebody else and…..
Ha ha!!!! Raja doesn’t deserve to be sad either though—I like to think that he and Rani went on to have a nice life together, although in her next life Rani will need to pay for what she did to poor Shyam. Shyam himself I think is noble enough to make do with Whiny Poornima, and will take solace in the children they have who will fortunately resemble him instead of her. 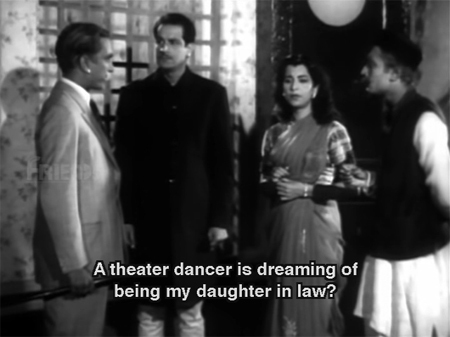 And maybe he will have a nice long discreet but happy love affair with another dancer, and Poornima will never notice because she is so completely self-absorbed. This sounds as if it can be made into a propah serial! Anyway since Raja’s birth is so stressed upon in the beginning I think it was clear that he would get the girl! But I think Shyam deserved Rani for changing onto a new leaf! Didn’t read the spoilers because I hope to buy the FIENDS (LOL) version when in India. The review has made me think it will be worth it, and of course shyam, and above all ‘Mere piya gaye Rangoon’. 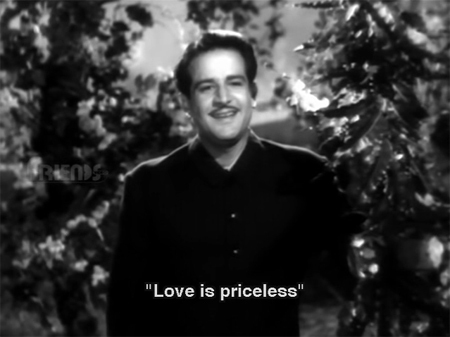 I don’t know why I always thought it was from ‘Albela’ till I found out from Tom’s download of the film. I think you will really like this one…it’s got lovely music and beautiful people in it! The cast is very nice, too, and my perspective does lead me to find gorgeousness in Nigar Sultana. I did manage to get my computer to play the movie all the way through one time, but I was still bothered by some of the strange edits… I’m glad, by the way, that you described the scene where the voice track dropped out – I actually wondered if that somehow could be the result of another defect in the DVD. Too funny—maybe we can trade, although it usually annoys me not to get a dvd that plays to the end :) Nigar is really beautiful—don’t you think Mohana is too? I love her dimples. And Gope just makes me laugh and laugh…very like Johnny Walker that way. He has a great way of moving, very funny body language. And I love Yakub too—he is funny but also very poignant in this, and I’ve seen him play a not-so-nice guy with some gravitas on occasion as well! That takes some chops! I loved quite a few songs from this without ever seeing them, and that says something because I usually don’t appreciate songs—especially from this era—as much until I’ve seen them in context. And I have the fIENDS dvd of Ratan I think…I hope it plays! Haven’t tried it yet. He played the villain in Paying guest as well. This was the first film, where I noticed him. 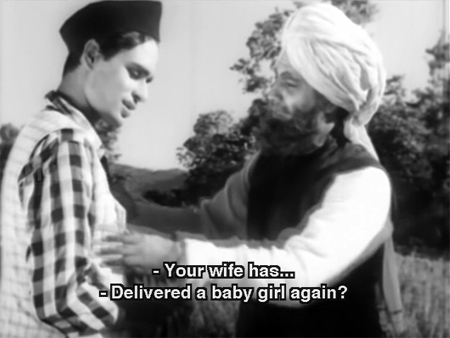 I had viewed Jogan (1950) a very long time back and had seen Rajendra Kumar in this movie in a minor role. Looks like he had done Patanga before that. Another find for me thanks to Greta. Must’ve been a struggling period for ‘Jubilee Kumar’ too ! 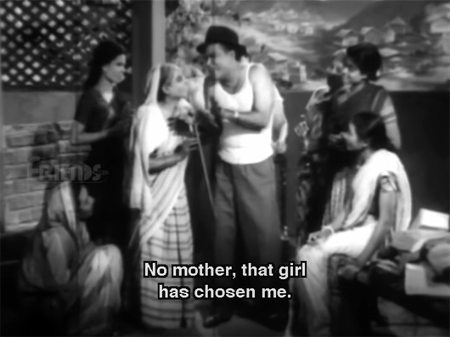 I got to know that Manoj Kumar too had a trivial role in Panchayat (1958) before he began his career as a leading man with Reshmi Rumaal(1960). Similarly, I read somewhere that Dharmendra had miniscule roles in Railway Platform (1955), Ujala (1957) and Kaagaz Ke Phool (1959) before his first leading role in Dil Bhi Tera Hum Bhi Tere (1960). I guess this gives sufficient fodder for one of Greta’s posts to dig out if these are indeed factual or just rumours. Greta? I don’t remember seeing Dharmendra in Ujala…but perhaps I am just too focused on my Shammi in that one :D Don’t remember him in Kaagaz Ke Phool either, but saw it long ago…Railway Platform is in my ginormous “to watch” pile. I guess they are blink and you miss appearances. Maybe you can keep an eye on Railway Platform for how he would have looked in his teens. Its quite believable since Dharmendra did work with Mohan Sehgal (the director of ‘Railway Platform’) in ‘Shola Aur Shabnam’ (1961), ‘Ishq Per Zor Nahin’ (1970) and ‘Samraat ‘ (1982) later on. maybe it was a way of paying back his respects to the director for considering him so early in his career. Sorry, the director of these movies is Ramesh Saigal and not Mohan Sehgal. 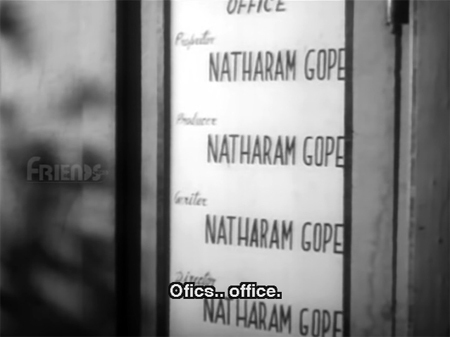 and BTW, Dharmendra’s name in ‘Kaagaz Ke Phool’ is listed as ‘Mr. Gupta’. Really, what role did he play! I can’t remember noticing him there! @Harvey – From what I’ve read its just a walk-over role in ‘Kaagaz Ke Phool’. Maybe we can spot him only when we look for him. In ‘Baharein Phir Bhi Aayegi’, Dharmendra played the lead since Guru Dutt (who was playing the lead) passed away during its making. Tanuja (one of the lead heroines) has mentioned in interviews that she was just taken aback by Guru Dutt’s drinking on the sets. She tried to bring him out of this by saying that they could drink after the day’s shoots, but he would have none of it. Mala Sinha (the other heroine) had a choice to leave the movie after Guru Dutt passed away. 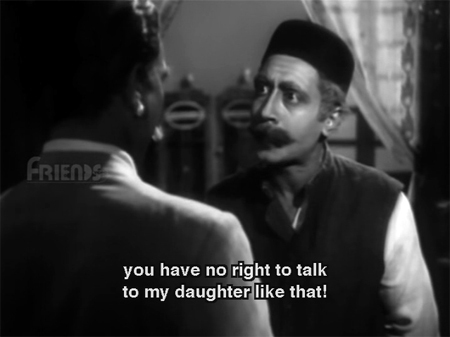 But she continued as she had an emotional bonding with Guru Dutt’s family. Yes, I think women fell for him left and right. I am pretty sure I would have too :D Hopefully more of his films will surface. I think he struggled for a long time (Manto implies that he did) and probably was just about to really start thriving when he died :( NOT FAIR!!!! You can watch Shyam’s daughter in this famous Pakistani TV play of the late 70s I think. The younger woman is Shyam’s daughter – Sahira Kazmi. She went on to become an acclaimed director later in PTV (Pakistan Television). Oh she is lovely :) Thanks so much for the information and the clip! You are Welcome :-). She is lovely. Looks like her father. Actually I am watching this entire play – Parchaiyaan – on Youtube chunk by chunk. It’s damn good. PTV plays in the 70s and 80s were excellent. I managed to see all the chunks of Parchaayian. 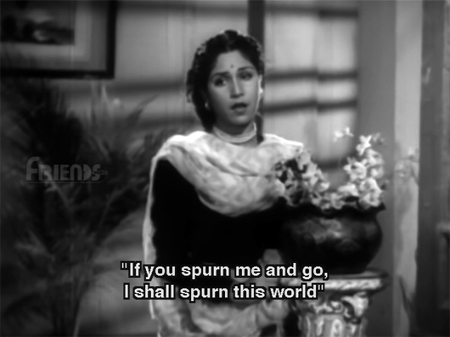 Sahira Kazmi is a super fabulous actor. She is the protagonist and covers the entire emoting range in this play. She later cut down on acting and directed a number of hard-hitting, critically acclaimed as well as commercially successful dramas for PTV. She’s up up there in the Pakistani intellectual circle of today. I am so happy I discovered her – thanks to your post on Patanga and Shyam. You should watch “Shabistan”, bollyviewer – bad print notwithstanding. It has Shyam in a double role!! Thanks for these tidbits of extra info (on Rajendra K. as well above :)…How did she end up in Paris, do you know? Did she live there for a long time? I think she’s absolutely charming! She spent alot of time in Beirut producing dance programs for the TV Media. She finally married her long time fiance and then shifted along with him to Paris where they settled down. Of course, Sami! Rajendra Kumar was an unabashed admirer of Dilip Kumar even after attaining the stardom. The clip of the Pakistani drama Parchaiyan you posted… do you recognize the old lady in green sari? If not, she is Renuka Devi (real name Begum Khurshid Mirza), She was a popular Bollywood actress of late 30’s and early 40’s and worked in many Bombay Talkie films including Jeevan Prabhat (1937), Bhabhi (1938) and Naya Sansar (1941). She migrated to Pakistan after partition, and as far as I know she never worked in any Pakistani film. But when the PTV started, she became one of the leading TV actresses of Pakistan. And Shyam’s daughter Sahira Kazmi is without doubt one of the best TV artistes and directors of Pakistan. Most of her plays are considered classics. The introduction of TV in Pakistan greatly effected Pakistani Film Industry because the best artistes, directors etc joined the small screen. Ooh, that is Renuka Devi? I have heard of her (and recently saw her in a Youtube clip of a song from Bhabhi). Thanks for the information! Long time follower, but first comment. I saw this movie on Doordarshan (state owner TV)when i was really young, and still remember the opening scenes of Yakub, it was really hilarious. Although didnt remember much about this movie, but thanks for brining the memories of doordarshan back. May the force of Hindi Cinema be with you!!! Actors.I had seen this movie with my friends 25 times. Shyams another film Shabistan is also memorable.Alas he had fatal accidenbt in this film while making in the end in 1949. Shyams another classic Samadhi co actors Ashok Kumar, Teenager Shami Kapoor. Memories are still with us. Yes I am happy to know about Shyams daughter Sahira Kazmi who is now in Pakistan Televiusion.I was a great fan of Film actor Shyam.He was a singing star. Dil Lagi, Nach. Alas, Phani uniya. Film actor Shyam(Shyam sunder Chaddha) never sang any song. The singing Shyam(Syed gul Hamid) was different. Details of these 2 Shyam s are discussed on this blog earlier.Please refer. Patanga extremely.Shyam,Gope and Yaqub all of them were talented actors.Film Industry should pay rich tributes to such actors. I just wondered-if we ignore PUrnima’s soppy ways and focus on the fact that Purnima loves Shyam, does her sincere feeling not deserve to be reciprocated? 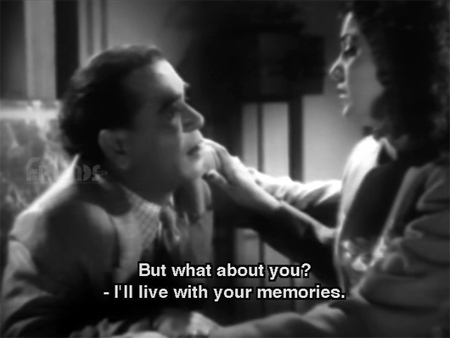 It raises the bigger philosophical question in my mind about unrequited love- in Indian movies (and correspondingly, in my mind), its always seems noble to selflessly love someone regardless of their feelings. Yet, in the West, I often find it being looked down upon. It seems to me that in the Western mind, moving on and such practical feeling is considered more acceptable. I wonder what you think about this. My perceptions have been formed by having lived in Canada for little over a decade- so I may be wrong and apologize in advance. Thanks! Love your blog and similar ones you’ve listed on your blog. For me anyway, the ability to accept reality and move on with your life and to be happy rather than wallowing in misery is just a better way to live! I would rather be happy with someone else who loves me in return than to waste away pining. The idea of suffering being “noble” is the problem I have…sometimes surely it is unavoidable, but not in this kind of scenario. Taking personal responsibility for your own happiness instead of putting it off on someone else or on “fate” I think is what we find nobler in the West. Selfless love is certainly very noble when the parties involved benefit (parents and children, eg) but in this case nobody at all benefits, not Shyam and certainly not Poornima. That’s the problem I have too when a “best friend” gives up his (reciprocated) love for the sake of his friend’s (unreciprocated) love—is anybody happier in the long run? I don’t think so. Thanks for your thoughtful comment, it’s interesting to think about the subject! Again, if it makes you happy and hurts nobody else to love ‘selflessly’ (which is a very overused word in human language), then fine. But I think instances of that are few and far between. .Thanks for ur informative comments. However to love selflessly is quite unique moral character. May be instances are few. To the person behind this blog : If you are in your 60s or 70s and due to personal reasons ever feel that you would call it quits for this blog, then PLEASE pass it on to another blogger with similar tastes and who appreciates the whole effort you put in to create this gem-of-a-blog.This has immense research value for those who want an insight into movies from that era.Please never delete this blog.And never feel that it would interest only those born in 30s,40s or 50s.Some things are timeless and priceless.I am from the generation born after the 70s and individual blogs like yours are an invaluable source of information about Bollywood movies of 40s and early 50s.THANK A LOT FOR THIS BLOG. I’ve just needed a break, but I have a whole bunch of films to watch and review still. And I won’t delete this blog myself, as long as WordPress exists so will this. Sorry for the delay in replying to you.What I want to add is, had you been doing deep,scene-by-scene analysis of vintage Hollywood movies like you do of Bollywood movies, your blog would have long gone commercial by now! !By now you would be getting well-paying offers to contribute to commercial movie sites.As of India, it’s only for a select group of connoisseurs at present.Try to explain an average man what “research” value “poorane,B&W,Azaadi ke pehle ke” movies have, and he will be at a loss!! This kind of frame-by-frame,meticulous analysis of Hollywood is available from a good many sites,but as of Bollywood movies, I have come across only two, one is yours and the other is http://dustedoff.wordpress.com/. Keep up the good work!! Hi, did a quick check but as I did not find any mention, thought I would write to say that “Namaste Namaste” is loosely based on the Carmen Miranda song “The south American way.” Ramchandra’s” arranger Chic Chocolate was quite aware of Latin American music and helped him with this one and the songs of Albela (Deewana, Parwana) etc. These songs are AMAZING and Nigar Sultana is made of awesome! 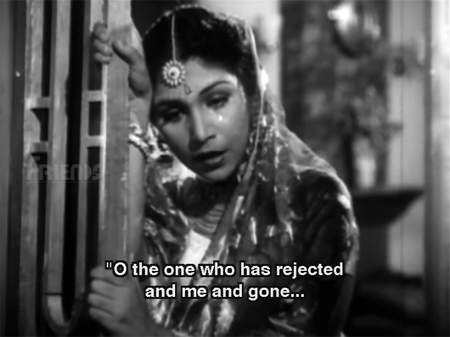 I’m slightly obsessed with Mughal-E-Azam at the moment and to me she was one of the elements that made that movie great. And I meant to also say, Memsaab, thank you so much! as opposed to 219000 (for one poster) for ‘mere piya gaye rangoon’, which you seemt to prefer. live long after (the already forgotten) tale of ‘Patang’. grandmother of the currently-popular actor Emraan Hashmi. Thanks for all these details Memsaab. 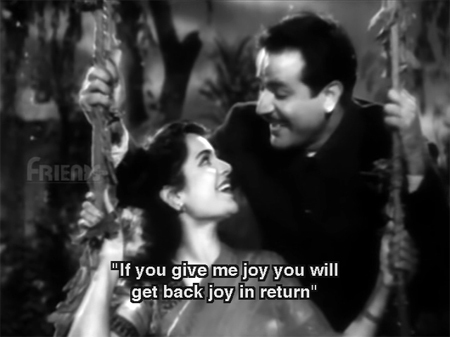 Patanga was a popular movie mainly because of the song – Mere Piya Gaye Rangoon. 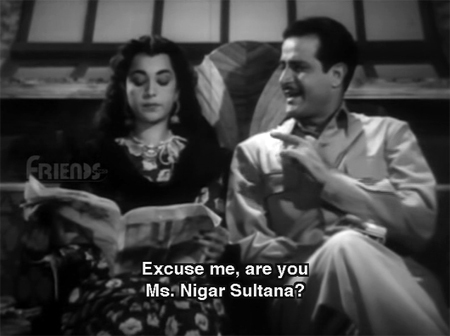 I recall having watched a television interview of Nigar Sultana when she was much older and had retired from movies. She had a huge Persian cat in her Bandra Home. You won’t believe it – she was so obese and unrecognisable. She had a couple of children and someone can correct me if I am wrong, she was K Asif’s second wife. K Asif was the director of Mughal-E-Azam. Hina had played Amitabh’s sister in “Adalat” and in the movie she gets raped and sadly she got typecast as the sister who had to be raped and killed. So sad, isn’t it? How talent gets wasted in Bollywood ! She did become very obese. I remember seeing Hina in Adalat (harrowing). A lot of talent gets wasted everywhere, it is sad to say! i am also a fan of actor SHYAM. can somebody please tell me full details of the fatal horse fall. Ajit of Mona darling fame was also in the movie. You did not mention him!